property description: casa inLycia is a part of Ecoclub inLycia, a private organization created to promote the eco-tourism in Turkey. It consists of two village houses next to each other, both around 80-100 years old. They were renovated to suit the short-and long-term stays of responsible travellers who would like to be on their own in the midst of the calm, wild nature of the West Tauruses. Gokceovacik, the village where casa inLycia is located, is a mountain village in the south-west corner of Turkey, close to Göcek. People living in Gokceovacik lost their economic base when the chrome mines in the region were closed down. The aim of establishing Casa inLycia was to develop a good example for the villagers so that they could come to realize the natural and cultural values around them and to put these to economic use. In the rehabilitation of the houses, only the local workmanship and local construction techniques were used; the houses were not shaped according to the habits of city-dwelling travellers, opting instead for arrangements the villagers were accustomed to and could therefore easily reproduce. The houses, renovated by protecting the original details with special care are hand-decorated with flower paintings, and furnished in authentic Anatolian style. Each house provides up to 4 beds in two rooms, a kitchen and a bathroom furnished to fit the hygienic norms. Hot water is available during 24 hours. There is a telephone but no TV, mobile phones are outside the coverage at the region. The housekeeping is handled by a maid who is the ex-owner of the houses. The two gardens cover a total area of 2500 m2. Besides the fruits and vegetables already naturally growing in the gardens, different food plants have been experimentally grown in order to find out the species best suited to the location and the climate; these will form the basis of developing sustainable livelihoods for the villagers. Two separate rooms in one-storey house with bathroom and an outside kitchen. One twin bedroom and one living room. 2 additional mattresses for ground are available for sleeping at the living room. Chimney at each room. A refrigerator, all necessary cooking equipment and dishes. A large veranda in front of the rooms facing to the vegetable garden with different kinds of fruit trees. Magnificent view of wild nature. Telephone, no TV, unreachable by mobile phones. Deep silence, only nightingale, eagle owl and cicada songs. Maid service for daily cleaning and, if you wish, for cooking (not included in the price, subject to pay separately) . Pets are allowed provided no damage will be inflicted to the garden and vegetables. Two-storey house, one room on each. Twin bedroom at upper floor and living room at ground floor. 2 additional mattresses for ground are available for sleeping at the living room Chimney at each room. Balcony at upper floor with a magnificent view of wild nature. Kitchen and bathroom on ground floor. A refrigerator, all necessary cooking equipment and dishes. Vegetable garden of 1500 square meters with fruit trees. Telephone, no TV, unreachable by mobile phones. Deep silence except nightingale, eagle owl and cicada songs. Maid service for daily cleaning and, if you wish, for cooking (not included in the price, subject to pay separately). The guests can cook by using the organic vegetables from the garden or ask to the maid to have the delicious regional dishes. They can also buy many kinds of home-made foods such as jam, cheese, olive-oil and bread from the villagers in order to support the sustainable living of the village and to encourage the villagers for keeping their cultural habits. Guests of casa inlycia are free to use all vegetables and fruits of the gardens for cooking. * The exchange rate for Euro to YTL is about 1,6.
use of hot water, kitchen gas, drinking water, and some basic foods such as sugar, flour, salt, olive oil, tea, coffee, etc. location: Gokceovacik, the village where casa inLycia is located, is a mountain village in the south-west corner of Turkey, close to Göcek. Surroundings: Gokceovacik village where Casa inLycia situated, is in Gocek region, at the south west corner of Anatolia, by the Fethiye Gulf. This is a place where West Taurus Mountains meet the sea. Being located only 8 km. away from Gocek town which is the most attractive yachting and sailing town in Turkey; the region offers all natural richness of the sea and the mountains, as well as very strong cultural heritage. This Lycian land of ancient times, carries plenty of marks from Roman, Byzantine, Seljuk, and Ottoman periods. Besides archaeological ruins and monuments, one can also witness the cultural and ethnographical richness of millennia in mountain villages that have only weak connections with the modern world. The most beautiful beaches, bays, hillsides, museums, historical sites, watersports , trekking, rafting, sailing, fishing, diving and even flying opportunities can be find out within a circle of 25 km. Location: Dalaman International Airport is the nearest airport. which is about 40 minutes drive away to Gokceovacik village. It is served by charter flights from all over the world. Alternatively one can fly to Antalya and take an air-conditioned coach to Gocek (three hours), or fly to Istanbul and take a domestic flight to Dalaman. By plane: Dalaman International Airport: 30 km. ; Antalya International Airport: 250 km. 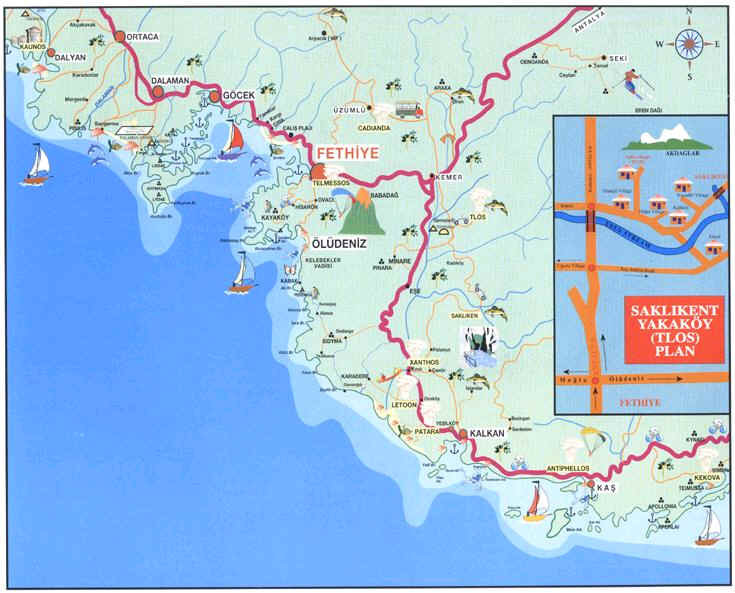 By coach: Fethiye (25 km) or Gökova (80 km) coach stations. Car parking is available if you have your own transport. If you don’t, it is hardly advised to hire a car which is available in all neighbouring towns and airports, in order to visit surroundings easily.